I've been involved in blind-tastings since the 1970s...I'm in a group which has been meeting on a monthly basis and 2014 marks our 40th Anniversary! Over the years, we have refined, streamlined and come close to perfecting this sort of event. When we started, one person was charged with "hosting" the tasting and, in those days, the tasting was held at the host's residence. These days, with members moving to far-flung locales, we now conduct these at one of three member's homes which are centrally located in San Francisco. Back when we started, the cost of the tasting would be divided amongst those in attendance. Having a bunch of accountants as members of our group, they quickly realized that when a member, or two, had bailed out, it stuck the rest of us with a higher tab. Now we assess everyone a set amount and one member of the group takes care of the "book-keeping," reimbursing the host for the cost of the wines as well as the bread and cheese provided at the tasting. Once you've picked the date and time, the host should select the tasting theme. (or specific Nebbiolo regions: Barolo, Barbaresco, Nebbiolo Langhe, Nebbiolo d'Alba, Roero, Lessona, Ghemme, Gattinara, California Nebbiolo, etc. As you can see, there are numerous themes for tastings. Start with familiar themes and you can branch out to do a tasting of Mourvedre wines or Grenache-based reds...or more esoteric tastings such as "Arneis," "Gruner Veltliners from Around the World," "Cabernets made by Left-Handed Winemakers," "Zinfandels Vinified by Winemakers Sporting Tattoos and/or Piercings," "Chardonnays with Critter Labels," etc. We asked each taster to bring their own glasses, so one person isn't stuck washing a few hundred wine glasses. Alternatively, some of us bring a large coffee mug with our box of wine glasses so we can spit and dump out excess wine. We had placemats printed with circles on which to set each glass, marked "A," "B," "C," "D," "E," "F," "G" and "H" as we typically taste 8 wines. Alternatively, you can put a sticker on the base of each glass or use a felt-tipped marking pen and mark each glass with the appropriate letter. You will need to create some documents for your tasting. We typically create a list of the wines being tasted, listed in alphabetical order by winery name or brand name. Here's a master page onto which your accounting person can transcribe everyone's ranking so they can be tabulated. We typically wait to hand out these various papers until the wines have been poured, as someone will invariably spill wine on them if they're handed out early. You will usually have to explain to people, especially first-timers, that the roster of wines is listed in alphabetical order...not the order in which we are tasting them, "A" though "H."
We prefer a fresh baguette sliced into small pieces as a palate cleanser to deal with palate fatigue. Some people like celery sticks for this purpose. 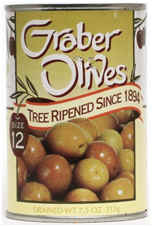 ...as they're not too salty, they're not in a vinegary brine and they seem to eliminate the harsh after-effects of tannic acid on your palate. The notion here is that apples have a lot of acidity, so they can freshen and sharpen your palate, while cheese 'dulls' the palate and so it can allow even a very modest wine to be appealing to some tasters. We typically figure one baguette for 4 people. In Burlingame, The Copenhagen Bakery will slice their lovely sweet or sourdough baguettes for you. We typically schedule our tastings to begin at 7pm. For me personally, I prefer to 'taste' while being a bit hungry, as dining before the tasting dulls your ability to taste sharply and critically. I go get something to eat after our tastings, but some people who are less fussy like to dine before the tasting. You won't be able to differentiate between the wines if the room smells of garlic or a chicken that's roasting in the oven. Similarly, if the people attending the tasting have splashed themselves with cologne, after-shave, perfume, lotion, skin moisturizers or they're wearing clothing that's exposed to those hugely fragrant "fabric softener sheets," you will not easily be able to judge the aroma and bouquet of the wines. Please! No perfume! No scented candles! No fabric softener! No lotion! No After Shave!!! You'll want to chill the white wines or bubblies, of course. I like to remove these bottles from the refrigerator 15-30 minutes before the tasting. When the wines are too cold, the aromas are restrained and it's difficult to evaluate them. Similarly, on a warm day, red wines don't taste so good when they are at ambient room temperature and are 75-80 degrees. I like to put those in the 'fridge for 30 to 60 minutes so they're served at cool, cellar temperature (55-60 degrees). Some people like to open certain wines to allow them to "breathe." Opening a bottle and exposing the surface area of a dime to allow the wine to breathe does not make any significant changes in the wine. In any case, why not taste the wines by opening them at the moment of service, much like the consumer who's purchased a bottle: they'll open it and start drinking/enjoying the wine. If you notice the wine seems to be changing (and sometimes the question is "Is the wine that's changing or me who's simply noting different features or characteristics of a wine? 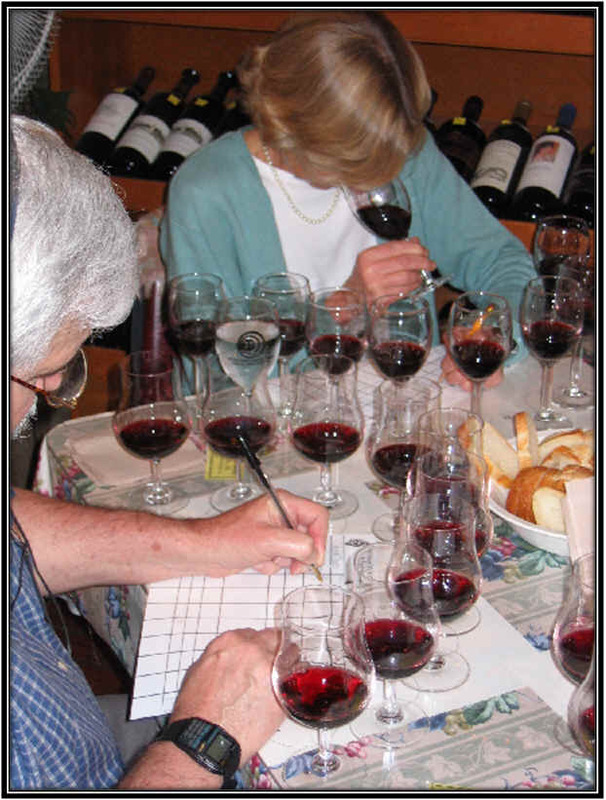 "), you can note that on your score sheet as part of your tasting notes. We broke too many wine glasses when the tasters were blind-folded, so now we brown bag or wrap the bottles so the wines are tasted "blind." PLEASE REMOVE THE FOIL CAPSULE FROM EACH BOTTLE TO FURTHER HIDE OR OBSCURE THEIR IDENTITY. You can't do much with bottles which are sealed with a screw-cap, though. 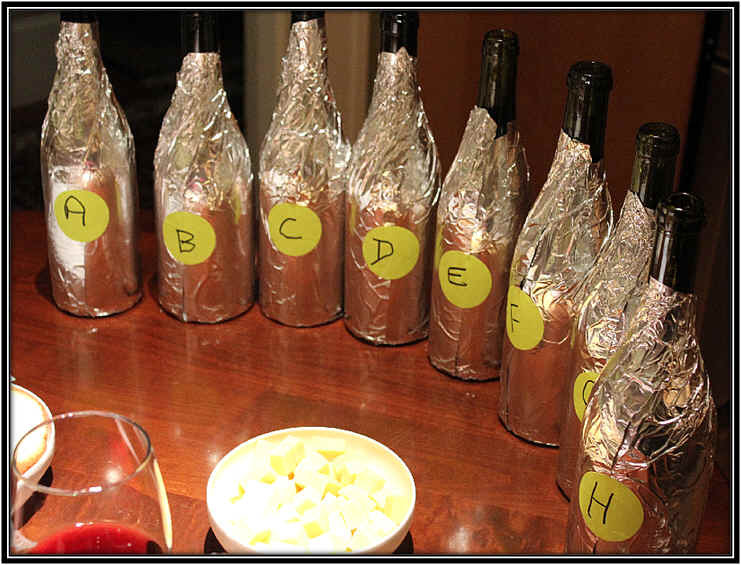 You will want to make the wines "anonymous," so brown-bagging them is one way to accomplish this as part of your blind-tasting regimen. More recently, I've found aluminum foil makes for an easy way to "hide" the bottles. Once everyone has arrived and set up their tasting glasses, we're ready to pour. Now everyone should receive a similar-sized pour, so you may wish to invest in a set of "shot glasses" and ask people to pour an ounce-and-a-half or two ounces into the shot glass and dump it into their wine glass. Some tasters will bring 10 to 14 ounce glasses to taste, a normal size for such an event. But there are those who invest in large, fancy stemware and a small pour into a 22 ounce glass looks like a meager serving. To preclude those bringing the ostentatious glasses from hogging the wines, a measuring device such as a shot glass is a good idea, especially if you're trying to squeeze 12 to 16 "pours" out of each bottle. If your group is a mere 6 or 8 people, you might not need a measuring device. The more distractions you have, the more difficult it is to evaluate the wines which any degree of clarity. Having soft classical music as background sound is fine, but having the TV on with a ball game in progress will make focusing attention on the wines a difficult task. We ask tasters to refrain from discussing the wines. This will allow for a more natural and true "result" for the group ranking. Having someone blurt out "Gee, that Wine F sure is a stinker!" will cause others to re-evaluate their assessment of that wine. Since some people feel pressured to conform, they may move Wine F from its first place perch on their score sheet down to a bottom-of-the-heap ranking solely on the basis of the blowhard who forced an opinion on the group. We will usually discuss our findings and what elements we liked or disliked about the wines as we unveil them. And we can chit-chat after the tasting, but doing so during the tasting only distracts tasters from doing their best critiquing of the wines. You will need to explain to the tasters that the sole requirement at this point is to "rank the wines in order of their preference." We don't care if you're 'rating' the wines using a 20-point, UC Davis scale or Robert Parker's 100 Point wine scoring system. Me? I simply write down adjectives to describe each wine and I put a star or two or three in the boxes to note wines I think are worthy of attention. I rarely find "3 star" wines, but some wines merit a star or two, some merit a half-a-star and some are noted as "minus" a star for wines which are poor. But it makes no difference how people "score" or evaluate the wines...all we need is their ranking and this is a universal scale. A rank of "1" is their first place or favorite wine of the tasting. A ranking of "8" is their least favorite. You will need each taster to fill out their tally sheet or chit with "A" though "H" on the left column and their rankings on the right. If "Wine A" is your least favorite, then please write "8" next to it. If "Wine B" is your favorite, then please write "1" next to it. Each tasting sheet should have a set of rankings with all the numbers between 1 and 8. Don't screw up the results with two 5th place rankings, for example. For a set of 8 wines, typically it takes most people 20 to 40 minutes to come to some sort of conclusion or verdict in terms of their preferences. Each tasters then fills out their ranking or verdict sheet and passes it down to whomever is charged with tallying the numbers. To be sure you're spot-on correct: the total number of points, adding the score of each wine, will be a number divisible by 36. Ten tasters will have a total, then, of 360 points. In the event two or three wines are tied with the same number of points for a particular spot in the rankings, the "tie breaker" is the greater number of first place votes. Once you've tallied the results, now you can unveil the wines and see who is the king of the hill. We typically unveil the wines last place to first, one wine at a time. We'll call out which wine finished last...tell the group "Wine F finishes last. It had 60 points, with no first place votes, 1 second place vote from Tim and three last place votes from Gerald, Jack and Mark." One bit of horse-racing, if you like. My colleagues call this the "Delta," the differential between your ranking and the group's ranking. A low Delta can mean you have pedestrian taste in wine or you're closing in on being a Master Sommelier! To Calculate This: If Wine A was your 8th and the group's 5th, that's 3 points. If you ranked Wine B 3rd and it finished third, that's "zero" and you're still at 3 points. If Wine C was your 1st place wine and it finished second, add one point to the column, so now you'd be at 4. This has no real meaning, but some tasters are especially thrilled to have a low Delta, while the fellow whose Delta is 24 (it's always an even number when you have 8 wines) feels like a complete and total failure. Sometimes we'd offer everyone a "Post-Tasting" wine...a "bonne Bouche" if you like. If we'd just been tasting big reds, a nice fruity, sweet white can be refreshing. If we've tasted dry whites and it's a cool weather season, perhaps a Port might be appropriate. Some friends overseas take turns in hosting...the tastings might be on a Saturday, late afternoon, early evening and dinner is provided after the tasting.